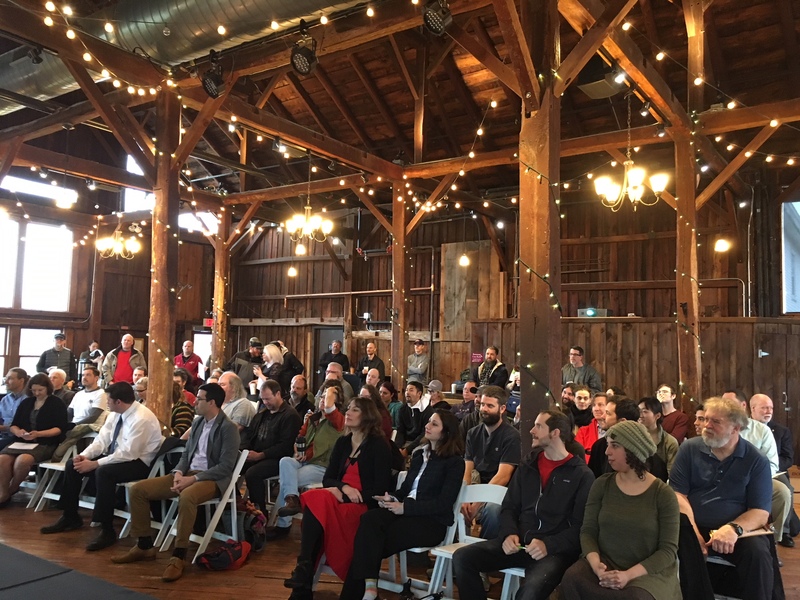 A crowd gathers at the Red Barn at Hampshire College for the Pioneer Valley Cannabis Industry Summit. Photo by Meg Bantle. Adult-use cannabis was legalized by Massachusetts voters in 2016, but based on the number of moratoriums and bans that have passed across the state since then, it’s clear that there are still some mixed feelings about cannabis on the local level. Salgado was one of several speakers who spoke at the Pioneer Valley Cannabis Industry Summit on March 30. 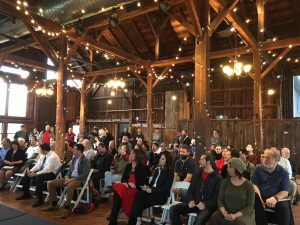 The Summit was hosted at the Red Barn at Hampshire College by the Massachusetts Recreational Consumer Council (MRCC) and Ezra Parzybok, a cannabis consultant based in Northampton. Communication with local communities and education was a big part of the summit. “I think the more people learn about the industry the more they’re okay with it,” said Mayor Alex Morse of Holyoke who was the keynote speaker of the event. 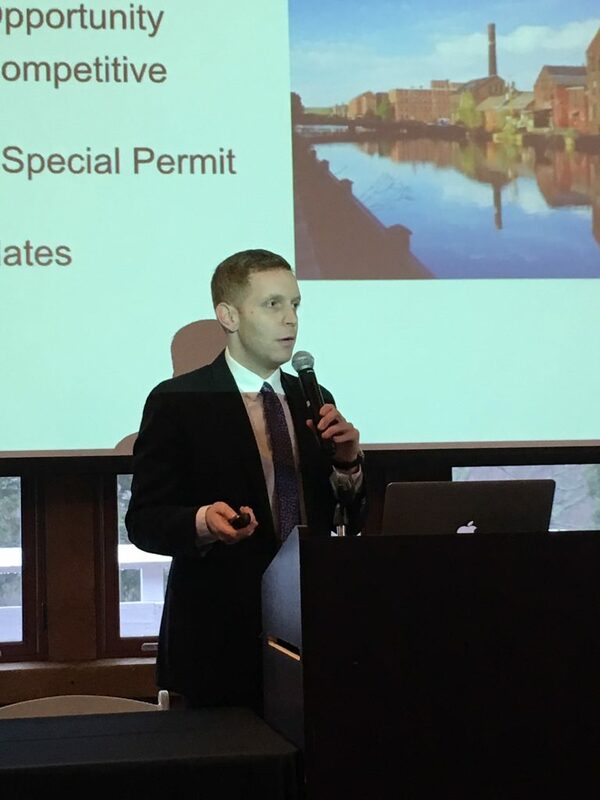 Morse described the cannabis industry as an economic driver and said many of Holyoke’s vacant mill buildings are perfect sites for cannabis cultivation, processing, and selling. While Morse has been a proponent of cannabis for years (he was the first Massachusetts mayor to endorse Question 4, the ballot question that legalized recreational marijuana in Massachusetts in 2016) he has been met with some resistance from city council members, particularly from former council president Kevin Jourdain who left the council at the end of last year. “Many people are still waking up to the possibilities of the industry,” Morse said. Mayor of Holyoke Alex Morse addresses the crowd for the Pioneer Valley Cannabis Industry Summit. Photo by Meg Bantle. “We didn’t really have to say anything after that,” Morse said. While many people in Holyoke are excited about the potential of the cannabis industry, the work of educating the public in Holyoke and in other parts of the Pioneer Valley isn’t done. Across the tri-county area of the Pioneer Valley, 24 municipalities have passed moratoriums or bans on recreational marijuana sale, and often on cultivation and processing as well. MRCC was founded to be the link between businesses, governments, and consumers, and Founder and President Kamani Jefferson said that getting out into the communities is essential to combat negative associations with cannabis in cities and towns. “(It’s) the fear of the unknown and not wanting to change the culture of the town or city,” Jefferson said. At the panel about education and community awareness, Salgado emphasized that communication and outreach will be essential to the success of businesses, and that education is necessary to make the new recreational cannabis industry inclusive of communities of color. She said that hosting informational sessions in communities of color, like in Holyoke where the population is almost 50 percent Hispanic, is needed to make the new legal cannabis industry accessible to the communities that have been the worst affected by the war on drugs. “This is one of many movements happening in this country, and this is an opportunity for us to be a different model,” Salgado said. The March 30 summit included many of the leaders in the Pioneer Valley cannabis industry, and the need for more educational events was a top priority, from providing educational materials as towns and cities across Western Mass to consider bans, to hosting informational sessions to make the industry accessible to communities of color. Events like the summit last week are just the beginning of the community awareness sessions that will need to happen in Pioneer Valley communities in order to make the new adult-use cannabis industry accessible and accepted by everyone.